BALTIMORE â Dec. 12, 2014 â Northrop Grumman Corporation (NYSE:NOC), today marked the delivery of its first engineering, manufacturing and development (EMD) APG-83 Scalable Agile Beam Radar (SABR) to Lockheed Martin (NYSE:LMT). The company attributes the expeditious development and production of the first EMD radar to the maturity of the system's technology and decades of producing and delivering F-16 radars. "Northrop Grumman's fire control radars have provided vital capabilities for the F-16 and other fighter aircraft for the past four decades," said Jeff Leavitt, vice president, combat avionics systems business unit, Northrop Grumman. "The progress to date in the APG-83 program reflects our enduring commitment to providing American and allied F-16 pilots with significant operational capabilities that give them the advantage for decades to come." 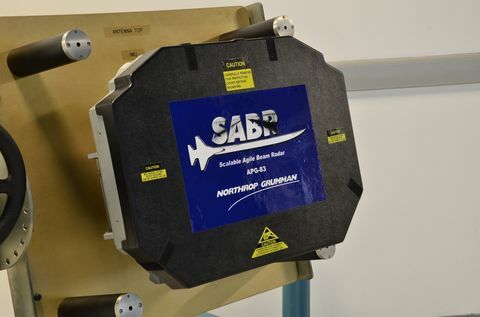 SABR was developed as a multifunction, active electronically scanned array (AESA) fire control radar that provides affordable, reliable fifth-generation air-to-air and air-to-ground radar capability to the F-16. Other AESA fire control radars developed by the company are currently flying on the F-16 Block 60, F-22 Raptor and F-35 Lightning II aircraft.